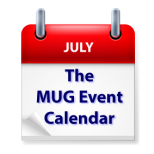 A slow week on The MUG Event Calendar happens each time we transition from one month to the next. FileMaker 14 will be the topic of discussion at an Australian group, while Apple Maps and Google Maps will square off in a showdown at a Florida group. A technology forecast will be offered in Connecticut and a photowalk will take place in Hawaii.